Lets make your exhibition stand, stand out from the crowd! 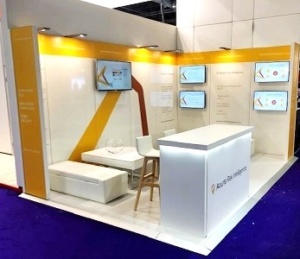 A new exhibition stand can represent a significant investment, which is why our experts are on hand to help you create the stand of your dreams, without blowing the budget! A versatile stand design with modular elements that can be changed around to accommodate different stand shapes, sizes and configurations means you will always be prepared for anything. Let us know what you are looking for, with as much detail you are able, and our stand experts are on hand to advise how we can help to make your vision a reality. Custom built stands are designed and made from the ground up specifically to fit YOUR requirements, they can work for any stand sizes and configurations. By making sure the brief we take is accurate, we can design a stand that can be built in different configurations which gives value for money from your investment. Giving us as much information as possible means we will be able to advise on some possible solutions. If you don’t have all the details straight away that’s not a problem, but the more you have, the better we can tailor your stand for your needs. We can also add value by suggesting some additional features or simplifying the methods used to achieve your plans. Our online enquiry form will prompt you with key questions to help us understand exactly what you are looking for. • Will you require flooring and lighting? • Do you need storage space for personal belongings or show collateral? • Do you need an enclosed meeting room or open plan meeting spaces? • Would you like Audio Visual equipment integrated into the stand or freestanding? We can even help you out with the increasingly required Risk Assessment information for show organisers. 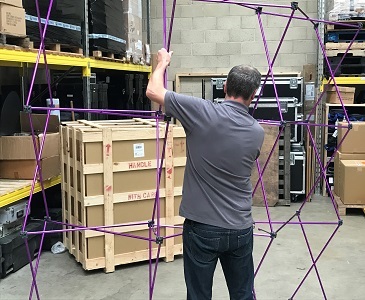 When it comes to the all-important stand build, we can either do this for you or supply a complete ‘Supply Method Statement’, which details exactly all the additional elements or tools you will require in order to erect your stand yourself. Some styles can be trickier than others to build yourself, if this is something you are planning, then it is worth mentioning this at the design stage, so we can make sure the design is as easy to assemble as possible for you. A modular stand is created by using components that are almost off the shelf. However, by not constructing every element from scratch, there are cost savings to be made whilst ensuring your specifications are achieved. But this absolutely does not mean it has to be boxy and boring – quite to opposite! The walls can be customised to any shape , size or configuration you desire, from elegantly curved backdrops, to aesthetically interesting architectural structures, with thoughtful lighting we can really bring your ideas to life. It’s a very cost effective and efficient solution as you have greater flexibility over custom build stands to add in additional components or indeed, make simple changes. One of the designs we are using an exciting system called T3, which enables you to create a modular style stand but whilst maintaining the convenience or portability as it packs away easily into custom wheeled packing boxes. Easy to fit panels of vinyl, foamex or fabric can be used to create your identity. These are slotted or fixed by magnets onto the modular framework making the set-up and dismantling speedy and efficient. Quick, clean & simple to erect. Click together convenience – no tools required. The frames themselves use a twist and lock system which can be easily customised to fit any stand space or shape. The walls can be straight or curved in any design you may require. With options of vinyl graphics, fabric or foamex along with a vast array of accessories, anything is possible. Our favourite and preferred style are light boxes with a fabric covering. They bring your stand to life and the fabric can be as vibrant in colour as vinyl. 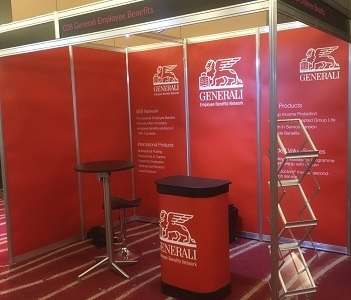 The lighting isn’t always brilliant in exhibition or conference spaces, so having your stand backlit will really make it stand out from the crowd, which is the whole aim of being there, isn’t it? Alternatively, this beMatrix framework system offers a stunning alternative modular build method, foamex panels add a polished and professional look. Please contact us if you would like to know more about this, or any of our modular systems available. beMatrix frame with foamex panels, downlights, built-in AV plus seating & storage solutions. If your exhibition uses a shell scheme, we hcan help you create the impact you desire using printed, branded foamex boards which are inserted into the frames supplied by the show organiser. With the right accessoires and impactful graphics you can really make your brand stand out. Shell scheme with printed Foamex graphics inserted. 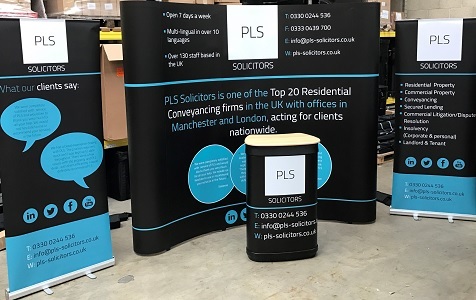 Pop-up or portable display stands are one of the most efficient ways of creating a large or small backdrop to showcase your company and have the added benefits of being quick and easy to install whilst packing away into compact storage boxes. A pop-up exhibition stand is made from lightweight materials in a cross braced system; this ‘pops up’ into a large framework yet concertinas down for transportation. Special bars are inserted into the frame to add strength and stability to the structure. 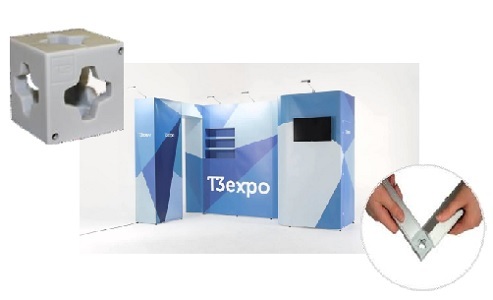 Pop-Up Exhibition Stand – quick & easy to erect, compact for shipping. 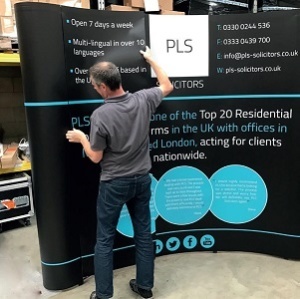 Pop-up graphics are attached to the framework and magnetic tape down each rear side of the graphic panels allows you to position the panel perfectly on to the magnetic bars. Graphics can be attached the front and rear of a pop-up stand, as well as to the ends, to create a completely seamless graphic area. Alternatively, you can use fabric panels. These are generally one complete piece of fabric and due to the high print quality available to us, a vibrant and colourful stand can be created. There are so many different types and styles of Pop-Up stands available that we have created an online brochure so you can see a wide choice of the styles, materials and types available. But don’t get bamboozled by the choices – we will be able to recommend a construction method based on your brief. A number or different portable elements can be combined to give an impactful large display but can also be used in other combinations as required – this is a very versatile way to maximise the use of your materials. If you would like to discuss your ideas for YOUR next exhibition stand, please give us a call or send an online enquiry and we will be delighted to advise. We are Exhibition and Conference logistics experts and can help with every step of the way to delivering YOUR perfect exhibition.